Due to our location, quality and services provided, we are fully expecting our condos to achieve net rental yields of 8% per annum; we have based the figures upon 80% occupancy in high season and 60% in the low season. 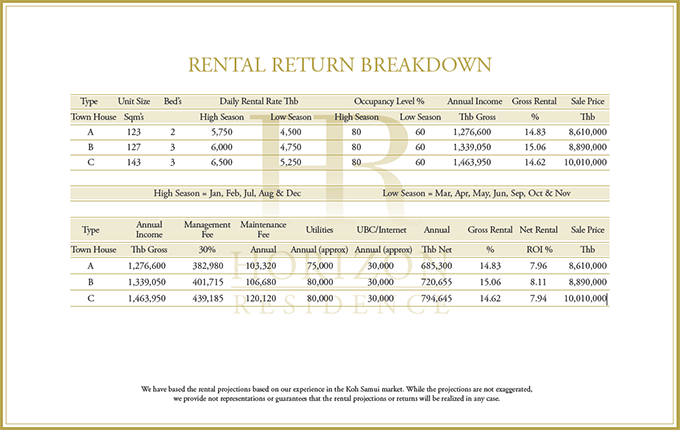 (See the rental return breakdown below for full details). We already have an established network of agents in place to assist us with advertising the Horizon Residence for rentals, these include agents that specialise in French, Korean, Russian and English customers. In addition we will advertise for rental customers via a Horizon Homes linked website, and rental sites including Agoda and Trip Advisor. Of course, we are mindful that this will be your property and as such, we will not tie you into any restrictive rental programs. You simply tell us when you do, and do not want to use the condo and what dates you would like us to find you rental income for. You are also free to source your own rental customers if you so wish. We have based the rental projections based on our experience in the Koh Samui market. While the projections are not exaggerated, we provide not representations or guarantees that the rental projections or returns will be realized in any case.